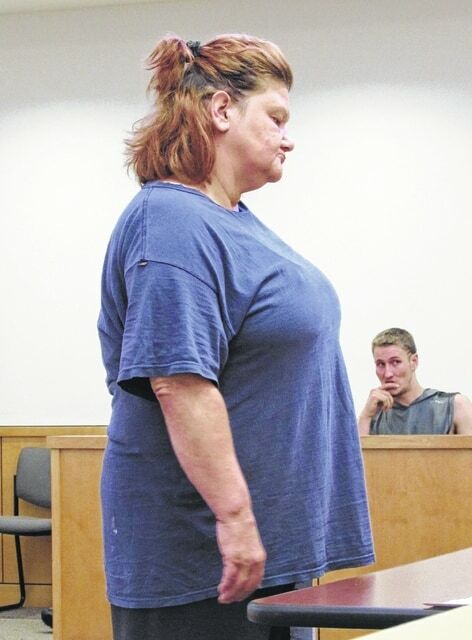 Deborah Jenkins is pictured in the Hillsboro Municipal Court on Friday. Also shown, in the background, is Elisha Collett. A Highland woman appearing on a new charge in the Hillsboro Municipal Court on Friday was placed on a $25,000 bond on a probation violation. Deborah Jenkins, 45, pled not guilty to second-degree misdemeanor charges of attempting to purchase an illegal amount of pseudoephedrine. While the case is pending, she is to have no contact with allegedly involved parties. She must also observe a curfew and enroll in substance abuse counseling. A pretrial is set for July 17. On Friday, Hillsboro Municipal Court Judge David H. McKenna said the probation department reported that Jenkins tested positive for heroin. Court records show that Jenkins has past convictions for domestic violence and possession of marijuana paraphernalia. A $25,000 bond was set on a probation violation. Records add that Jenkins is on reporting probation. Also on Friday, Randy Smith, 28, Leesburg, appeared on a new charge and saw a recent furlough revoked. Records show that he was furloughed on June 10 and ordered to complete the day-reporting program. McKenna said Smith was furloughed 162 days early after a different furlough was revoked in March. Records show that Smith was convicted of theft in 2012. The judge added that Smith’s furlough earlier this week was his “last chance” at reporting probation. Records also show that Smith was convicted of first-degree misdemeanor assault in 2013. Smith pled not guilty to his new charge of second-degree misdemeanor possession of drug abuse instruments. The judge then ordered a drug screen, which Smith passed. While Smith’s case is pending, he is to have no contact with allegedly involved parties. He must also observe a curfew. A jail sentence was also imposed on Todd Baucom, 38, Blue Creek. McKenna said the probation department reported that Baucom admitted to using methamphetamine and marijuana. The judge said Baucom was already scheduled to serve a 30-day jail sentence on a probation violation in July. Records show that Baucom was found guilty of fourth-degree misdemeanor driving on a suspension in January. Records also show that an additional 30 days in jail were suspended on an identical conviction in March. On Friday, Baucom admitted to his probation violation. When asked, he said he had not completed ordered community service. The judge then asked Baucom if he had anything else to say. “No, sir, there really ain’t much to say,” Baucom told the court. “Well, I appreciate your honesty about that,” McKenna said. The 30-day jail sentence that was scheduled for July began on Friday. Baucom will be furloughed after 10 days in jail. The rest of that sentence is reserved for August. The 30 days that were previously suspended in March will also be reviewed at that time. Also found guilty of a probation violation was Elisha Collett, 21, Wilmington. The Times-Gazette previously reported that he pled guilty to a charge of attempted illegal purchase of pseudoephedrine in December. As per an agreement, 74 days of a 90-day jail sentence were suspended, and Collett was given credit for 16 days in jail. He was also ordered to obtain counseling and to stay away from Walmart. Collett was placed on reporting probation. A $500 fine was suspended. In April, he appeared on a bench warrant and was found guilty of a probation violation. Half of his previously suspended 74 days in jail were imposed. He could be furloughed that upcoming Saturday if he passed a drug screen. Records show that the probation department filed an affidavit last month and that a warrant was then issued for Collett’s arrest. He appeared on that warrant Friday, and his furlough was revoked. According to records, the remaining 33 days on his sentence were imposed. He can be furloughed on June 18 if he passes a drug test. The remainder of his sentence is scheduled for a review on July 27, records add. In other cases, a jury trial was scheduled for Katina Shoemaker, 20, Chillicothe. She faces charges of first-degree misdemeanor theft. Defense attorney J.D. Wagoner said the state offered a plea agreement on Friday. The offer was rejected. Records show that a jury trial is set for August 11. A final pretrial is scheduled for July 9. Records add, if Shoemaker is found guilty, this case could be a probation violation of two suspended sentences for disorderly conduct. A charge for attempting to purchase an illegal amount of pseudoephedrine was dismissed for Starr Hall, 38, Bainbridge. Wagoner, also representing Hall, said Hall was going to be entering the STAR program on a different case in another county. As such, the state dismissed her charge in the municipal court. A charge was also dismissed for Erin Troy, 24, Hillsboro. McKenna said Troy pled guilty to theft in December. Sentencing was deferred to give Troy time to complete counseling and to pay restitution. As of Friday, Troy had complied with those conditions. She said the counseling had “changed (her) life.” Troy added that she has been clean since December. Troy will have to pay court costs. Finally, three bench warrants were issued after defendants failed to appear. Katherine Page, 18, Hillsboro, failed to appear for an arraignment. She faces a charge for possession of drug abuse instruments, records show. A $2,000 bench warrant was issued for her arrest. Daniel Young, 25, Greenfield, faces a charge of theft. He failed to appear for a pretrial on Friday, and a $1,000 bench warrant was issued for his arrest. Tabitha Wilson, 24, Lynchburg, failed to appear for an arraignment on a charge of attempting to purchase an illegal amount of pseudoephedrine. Records show that a warrant was issued for her arrest.